A Grillin' Guy Sneak Peek From MFT, Or Is That My Hubby? Well, it's Monday and time for another of Jen's Sketches For You To Try! No wait, that's on Saturday. Oh yeah this is the card I was GOING to post on Saturday, but didn't for some timing issues! So, I guess ya'll get a double dose of the same sketch from me (I just want you to see how versatile it is--yeah, that's the ticket!). Actually I'm giving you a little sneak peek at what's to come this Wednesday from My Favorite Things--The first "Who's That Guy?" set, subsequently called "Who's That Grillin' Guy"!! I know who it is!! 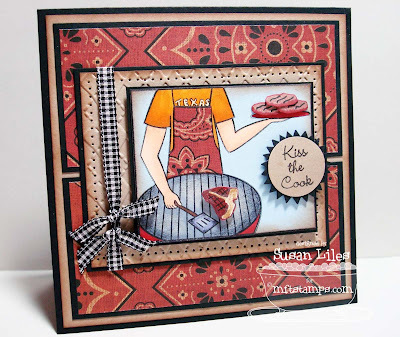 This card would be a picture of my hubby last weekend on Memorial Day when he grilled anything and everything that used to walk on 2-4 legs from our freezer. He's a big Texas Longhorns fan, so I thought it would be fun to ink in the lettering on his shirt. It was so tiny, but I did the best I could (ya'll can click on the picture for a more detailed view). I used Copic markers for the most part on the coloring, but shaded over it with Prismacolor Pencils in some areas(no OMS). I like how the grill turned out! The blue and the apron is paper-pieced and I used an old friend, the Black and White Gingham mini ribbon. Hello, old friend! Anyway, stay tuned tomorrow evening for the MFT Blog Hop, with 3 new sets being released on Wednesday! I really love this set, but you are going to FLIP over another one of the new ones!!! Ok, gotta go and kiss the cook (again and again and again...)! SUSIE Q-TIP: I don't have the new little "medallion" Nestabilities shapes that make the little "pinked" edged circles (yet). So for this, I went ahead and glued the kraft sentiment to another larger black circle and snipped little tiny triangles all the way around the edge. It didn't take that long to do and since it is a small embellishment, my imperfections don't show as much (I hope!). Suzie, this is SO FABULOUS!!! I love the bandana paper and the grill marks! Everything looks so realistic! :) Great job! Oh, I so love it! Cute card!! I have a little tip, too -- could you use pinking shears on the triangle cuts of the medallion? I don't have a pair -- got lost in Mom's stuff!! I like the Texas on the apron -- It's ERIC all the way! Oh my....I love this one also! I never would have thought to use that CB folder but it looks perfect.